Gauntlets There are 12 products. 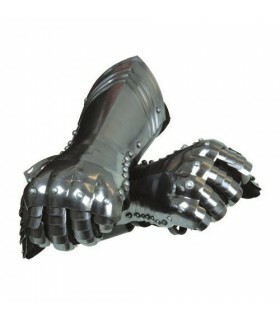 Articulated steel gauntlets 1 mm. thick. Glove leather interior. Pair of gauntlets smooth. Nonfunctional. They correspond to theFull Armor sixteenth century. 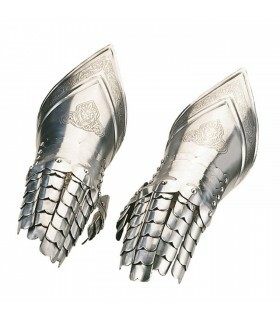 Pair of chiseled gauntlets. Nonfunctional. They correspond to theFull Armor sixteenth century. Leather gauntlets made about 2 mm Da skin comfort without sacrificing the hand guard against possible accidents. Ability to realize them in any color besides black. It includes partner. 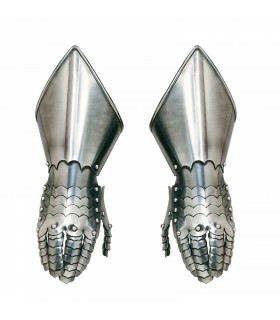 Couple of functional medieval gauntlets with articulated fingers. 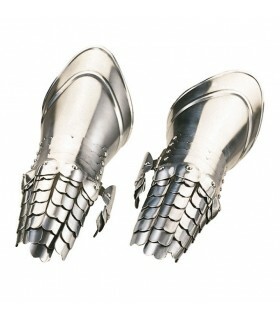 Pair of medieval gauntlets metal scouts.DO NOT include the leather glove. 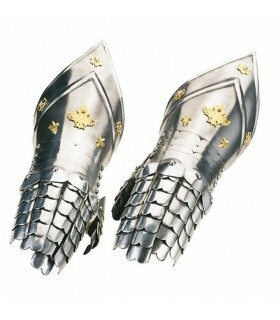 Excellent Gauntlets belonging to the Exclusive Collection of “add-Ons Armor Historical”. Include the certificate of Quality and Origin, Made in Toledo. 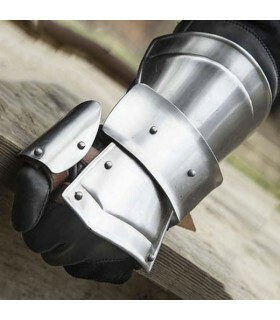 The gauntlets were made by hand, one by one, by the craftsmen of MARTO. 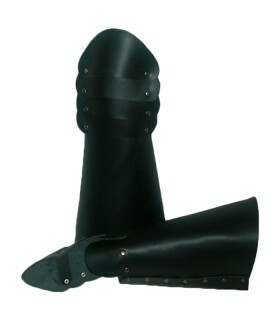 Gauntlets medieval short set Markward, manufactured in carbon steel with a thickness of 1.2 mm Is adjusted with leather straps. 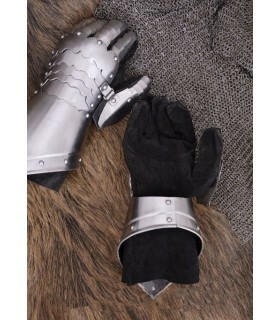 We recommend that you accompany these gauntlets with leather gloves for more comfort. Gauntlets medieval decorative and articulated. 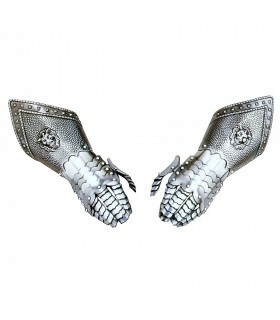 The gauntlets are made of stainless steel and come decorated with a lion. 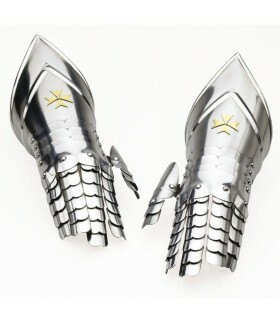 Excellent Gauntlets, chiseled by hand belonging to the Exclusive Collection of “add-Ons Armor Historical”. Include the certificate of Quality and Origin, Made in Toledo. 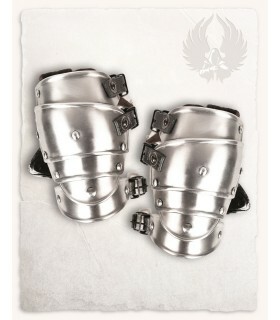 The gauntlets were made by hand, one by one, by the craftsmen of MARTO. Excellent Gauntlets, chiseled by hand with decorations in gold belonging to the Exclusive Collection of “add-Ons Armor Historical”. Include the certificate of Quality and Origin, Made in Toledo. The gauntlets were made by hand, one by one, by the craftsmen of MARTO. 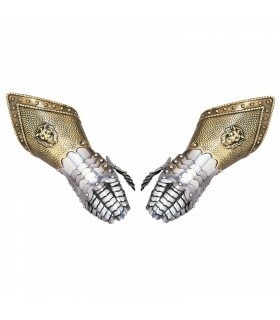 Excellent Gauntlets Templar with decorations golden belonging to the Exclusive Collection of “add-Ons Armor Historical”. Include the certificate of Quality and Origin, Made in Toledo. The gauntlets were made by hand, one by one, by the craftsmen of MARTO.